We just finished a five week cross country trip from FL to CA and back in May. We stayed at 9 military RV parks. All are very different. 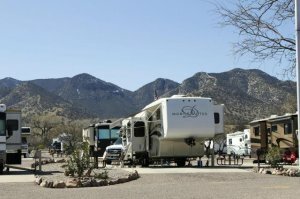 This is just a lovely RV park in a very quiet area of the base. We actually saw deer as we were walking around. Nice level concrete sites with full hook ups. The bathhouse/ clubhouse is clean. I have nothing negative to say about this place. I cant wait to return actually.